Reprinted with permission from The Simple Art of Salt Block Cooking (Ulysses Press, 2015). Remove all but top leaves from rosemary sprigs. These will be your skewers. Cut meat off bone, trim fat, and cut into approximately 1 1/2-inch pieces. In a medium bowl, combine 1/4 cup olive oil and lemon zest, lemon juice, mint, rosemary, and garlic. Add lamb and toss to coat with marinade, cover with plastic wrap, and refrigerate for at least 2 hours. Heat salt block on grill according to the instructions that came with it, until the surface temperature is about 550 degrees. Cut Halloumi into 1 1/4-inch cubes. Coat cheese with remaining 2 tablespoons olive oil. Cut zucchini in half lengthwise and then into 1-inch half-moons. Cut bell pepper and red onion into 1-inch chunks. Beginning with lamb meat, thread the kebab. Add 1 zucchini moon, 1 piece Halloumi, 1 piece pepper, 1 cherry tomato, and 1 piece onion, followed by another piece of lamb. Continue threading skewers with remaining ingredients in the same order. Place 3 skewers on hot salt block and cook until meat is browned, about 4 minutes. Flip skewer, and cook the other side until meat is browned and cooked to medium, about 4 minutes. 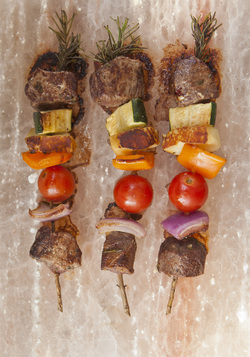 Place on a serving platter, and keep warm under aluminum foil as you cook remaining skewers. If desired, serve with couscous on the side. *May substitute yellow summer squash for Halloumi cheese if desired. Cook’s Note: Halloumi cheese, often sold in 8-ounce packages, has a high melting temperature, making it good for grilling. Grill any remaining cheese and leftover vegetables that do not fit on the skewers to serve on the side or as leftovers for lunch.